I was jogging in our neighborhood one day when I passed by a house under construction. I caught a waft of trimmed wood, and the scent suddenly transported me back in time, somewhere in my childhood, when my father gave me a gift of wooden chess set. Isn’t it interesting that inhaling a certain odor can evoke very specific memories, even though how remote those memories are? For me smelling a citrusy fragrance will remind me of this girl that I had a crush on in college, as she wore a perfume or cologne that smells like lemon. Or maybe it was just their laundry detergent. Or maybe it was her lemon-scented Eskinol. Whatever it was, it is forever locked in my mind. Then when I smell formalin, this brings me back to my medical school days with those “aromatic” cadavers at the UST Anatomy hall. The grueling long study periods up to the wee hours of the morning. The difficult exams that made me sweat like rain drops. By the way, the smell of “xerox” paper reminds me also of those days where my classmates and I will hang out in Dapitan photocopying handouts, notes, and leaked out old test questions (patok daw!). When I sniff pine scent, this brings back happy childhood memories when my family went to Baguio. Where we stayed near the Teacher’s Camp. Strolled down Session Road. Visited Burnham Park. 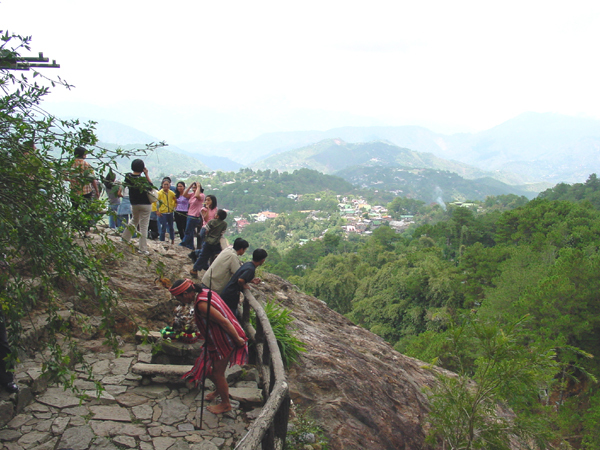 And enjoyed the spectacular view at Mines View Park, while also watching some natives perform the Igorot dance. The link between smell and memory is not just a whiff of your imagination. There is really a scientific and medical reason for it. The center in our brain for the sense of smell is in the olfactory bulb which is near to a part of our central nervous system called the hippocampus. Hippocampus means the “seahorse” due to its the curled up shape, located deep in our brain. Neuroscientists have learned that the hippocampus is important when it comes to processing new memories. In fact, in people who have damage to this area of the brain can have trouble remembering what happened to them. Some politicians we know, have problems remembering where they came from and what they promised before they got elected, so it must be a “hippocampus” thing. But then again it may be that something else is wrong with their brain. Sorry, I got sidetracked. Few days ago, when I called my wife that I was about to come home, she did not answer the phone right away. On my third call, she finally answered and I learned that she was outside the house, near the back door of the garage, cooking “tuyo” (dried fish). You see we try hard not to cook dried fish inside the house as it will surely stink our place. Or if we do cook it inside, we make sure all the windows are open and we have scented candles lighted up to neutralize the smell, or else our non-Filipino visitors will think that we have a dead rat trapped in the ceiling. Anyway, as soon as I heard my wife said that she was cooking tuyo, I swear I began to smell the peculiar scent of dried fish. And I was in my office still! Did the scent travelled through the phone lines? Could it be that the sound signals were transformed into olfactory signals through the phone towers? Or maybe it was all olfactory hallucination or what is medically termed as phantosmia. Whatever the reason was, I really thought I was smelling dried fish, even though it was plainly not there. Maybe it was my memories of home, the one in Manila where I grew up, where I spent many fond years with my family, with home-cooking like “ginisang munggo” and the proverbial tuyo, awakened the sensation that I felt I detected that notable “fragrant” scent. Even if it was all in my mind. And for one nostalgic moment, I was home. Time to go home now. To my present home with my wife and kids here in Iowa, where new sweet-smelling memories are being formed. And I know I will relive these moments again…..someday. I hope my hippocampus stay intact. It is also time now to really sniff and taste that dried fish that my wife lovingly cooked, even if she has to do it outside our house. that was nostalgic bro, it is really powerful and magical how scents can bring us back in time.It’s like its embedded on our memory and whenever we smell something alike we remember certain things or events…nice one..
Scents can sometimes evoke more vivid memory than visual stimuli. Thanks John. yes, scents can relive memories..
Tuyo…erg, now I’m officially hungry! The scents you describe are all too familiar. So are some of the associations. Did not know you went to UST. Small world, my friend. I found the lemon-scented memories amusing. You are a romantic at heart, PT! Does it mean you’re a UST alumnus too? Oh well, thanks for being my “suki” here in my blog. Your comments are always appreciated.